The rules of the blog say, as soon as we’re into Advent it’s OK to start posting up Christmas material. So to get the ball rolling here’s a recording of Magpie Lane, from one of last year’s Christmas concerts. I learned this song from the EFDSS Take Six archive – now part of the Full English. It’s from Janet Blunt’s MSS, and she collected it from the indefatigable William Walton of Adderbury, North Oxfordshire. 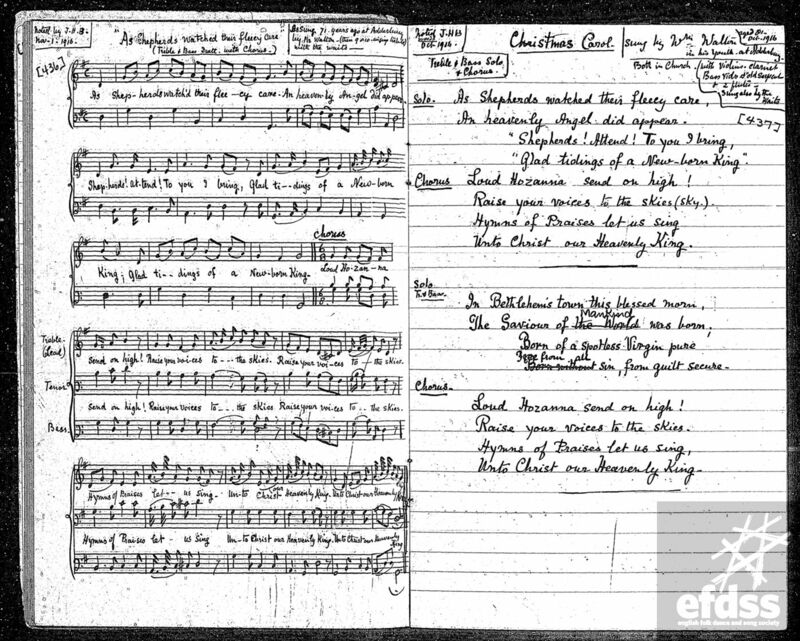 Blunt’s transcriptions of the various carols she had from William Walton – Newton’s Double is another – are remarkable in that they have 2 or 3 harmony parts as well as the tune, the octogenarian Walton being able to recall the various parts he had sung over the years. The bass vocal / cello line here, and additional vocal harmony line in the chorus, are all as noted from William Walton; the only thing we’ve added is the short instrumental ‘symphony’ between the verses (and one extra verse, from the five originally published in 1785 – see below). As Shepherds Watched Their Fleecy Care, from the Blunt MSS. Sophie, the cellist in Magpie Lane, had actually sung on a recording of this piece while a student. That was on While shepherds watched: Christmas Music from English Parish Churches and Chapels, 1740–1830 by Psalmody with The Parley of Instruments, directed by Peter Holman. The approach on that disc is informed very much by a classical music aesthetic. We treat the song far more like something from the folk tradition. The recording below was made last December in the reverberant acoustic of the Roman Catholic Church of St. Dunstan, Woking. There was a good recording of the song from last year’s Holywell Music Room gig too, but the cello is particularly sonorous on this recording – Ian Giles’ bass notes are also captured rather well, I think. Many thanks for fellow Magpie for recording all our Christmas gigs, and sharing the recordings.